Quick before they’re all dead! I was bored. I tend to do random things when I’m bored, such as fly to Chicago for a baseball game, attempt ocean kayaking, or watch Oprah. It’s a good thing I decided to act before 4/20 or I would have likely purchased a baby pig like some friends in south Florida did. So I could make fun of all the assholes clogging my FaceBook with Farmville updates. I’m a real farmer, you social media wanna bes! I’ve read countless articles and websites about the growing trend of backyard chickens. “Have your own fresh eggs!” they proclaimed.I wanted to try it so I could be hip and chat to other hip people over organic chai tea lattes while cruising farmers markets in my Prius, or something. Social experiment to see if I could ever actually kill a chicken. Prior to this the only thing I ever intentionally killed was a lobster. That hobo in the alley…that was accidental. To learn more about an animal I only knew in plucked, chopped up, plastic wrapped form. To have something to write about. Seeing as my first chicken died yesterday, I figured it was time to start writing before all I had to write about was my new compost heap. The first question people ask is “where did you get them?” Chicks are available from a variety of sources on the web. Just hatched chicks are boxed up and shipped off to customers. The just consumed yolk provides the birds with enough nourishment to make it through the shipment with heat packs to keep them warm. 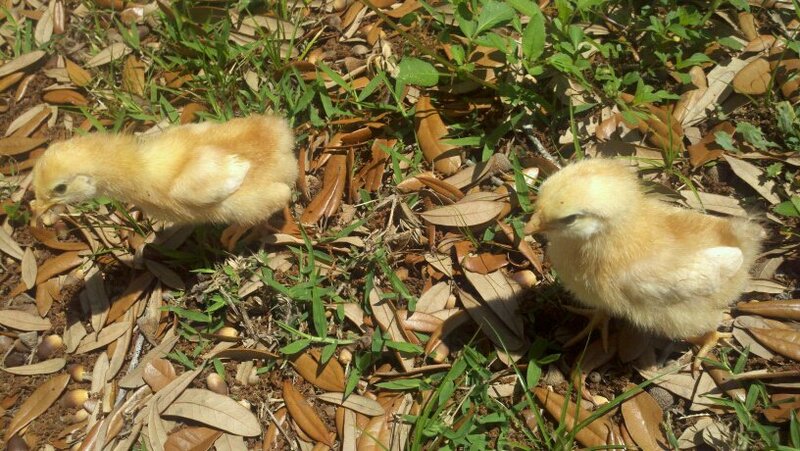 Locally chicks are available from farmers (check Craigslist) or from feed stores. I found Shell’s feed store selling chicks off of Nebraska Ave in Tampa. Normally you pick up a very different type of chick on Nebraska. When purchasing chicks make sure to ask if they’ve been sexed. “Straight run” chicks means that they have not had their chicken junk inspected and it’s up to you to find out. Rosters are generally illegal in suburban settings so be sure to get a “pullet,” better known as a young hen. Sexed chicks go for $2-6 (I paid $3) with straight run chicks costing less. I grabbed a 5lb bag of started feed, a feeder, waterer, and some pine shavings and was off. A stop at Lowes armed me with twelve 36 x 2 x 1 boards and 25 feet of plastic chicken wire. Armed with my chicks and my chicken housing supplies, I stopped off for an ironic lunch at Chick-Fil-A. Hm. Lemon Pepper chickens are my favorite species.